This is the essential resource for anyone thinking about graduate or professional school. The newly revised and thoroughly updated third edition has the latest tactics for online admissions, links to hot websites, and recommendations for further support. 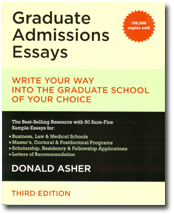 Graduate Admissions Essays offers a wealth of information found nowhere else. This section makes available many of the key school lists developed for the second edition of Cool Colleges for the Hyper-Intelligent, Self-Directed, Late Blooming, and Just Plain Different. We hope you find them intriguing enough to realize you've simply got to have this book. You can take care of that little detail right here. ...The most important part of research is passion. My passion for this topic, choosing the right college when you are hyper-intelligent, self-directed, late blooming, or just plain different, carried me across a full decade of inquiry. My first vision of this book was that I'd design a methodology to identify cool, and then list and describe the "most cool" colleges in some ordinal ranking until I got to a reasonable number of schools or pages, whichever came first. I naively blundered into this endeavor expecting it to be easy. It proved very difficult after all, and in the end, this book became a hobby worked on over a ten-year span. ...I hope you find your college, too, a perfect place for you, a place where you'll be happy, excited, welcomed, appreciated, and productive, a place that will launch you into the rest of your life like a trampoline. You deserve this. From the bottom of my heart, I wish you good luck. I wrote this book for you. These are just a few of the schools that have hosted a Donald Asher Presentation. Voice 775.557.2121 ext 203 • Fax 775.557.2525 • ©2007 by Donald Asher except as noted.